Scouts take the 2017 MD Lighthouse Challenge – Chesapeake Chapter U.S.L.H.S. 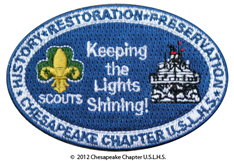 We have received Scout Patch Program applications from six Scout troops that participated and finished the 2017 Maryland Lighthouse Challenge, earning the Chesapeake Chapter Scout Patch! The following troops received their patch, certificates and the bonus Thomas Point Shoal coaster. – Led by Sonya DeGuzman – Cadettes: Rosalee Simmons, Kaitlyn Heng-Fishchbach, and Sarah DeGuzman. – Led by Joseph C. Moody – Lion Cub Scout: Luke McPhillips. – Led by Matt Gallagher – Scout: Ryan Schaum.